The Holiday Season is upon us and we’d like to take this opportunity to thank you for your continued support. 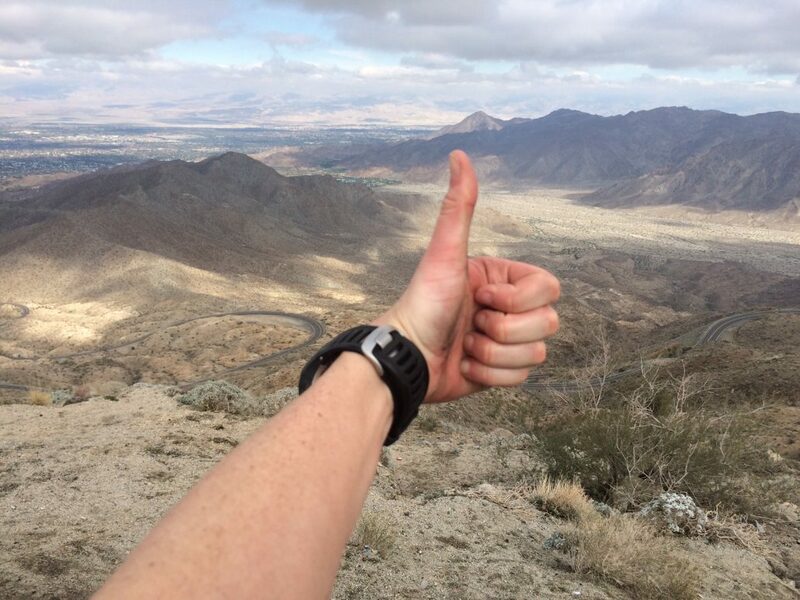 Your feedback and loyalty fuel our relentless motivation to develop novel sports technology. Thank you. Watt kind of cycling data do you need? Today we bring you a review link, and a perspective about choosing a single side crank-based power meter. Investing in a power meter is an important decision – one that’s bound to transform your riding experience and advance your cycling performance. It can also be a pricey venture with many power meter units running close to $1000 and others well over $2,000. Through our commitment to high quality data for all cyclists, we’ve focused our early developments on a left-leg device and kept the price under $400 USD. Here is some background in choosing direct force, single sided crank-based power meters. 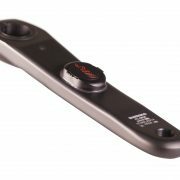 A direct force power meter can be theoretically located in any part of a bike’s drive chain. A bike’s drive train can include any component that transfers energy from a rider to the point of contact on a bike. As such, any one of the following components can be considered a part of the drive train: pedal, crank arm, crank spindle, crank spider, chain, wheel hub, wheel spokes, wheel rim, and tire. The farther the meter is located from the rider, the more losses are absorbed by the bike before getting to the power meter and the less detail about the rider’s cycling style can be discerned. 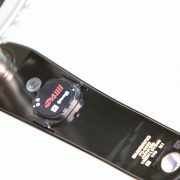 The PRECISION power meter doubles the very accurate power measurement from your left leg to give you a single, very close estimate of your total wattage output. While we all have cycling leg imbalances, the single-leg power meter methodology has proven to deliver highly accurate data to empower cyclists with the information needed to advance their performance. To this effect, PRECISION delivers a left leg accuracy range of 0 to 4,000 watts at +/- 1% error, and records a cadence range from 10 to 170 RPM. And, if you know of existing leg imbalances, our latest upgrades allow you to manually adjust your scale factor for an even closer estimate of your combined power output. So what does this mean to you and your investment in a PRECISION single-leg power meter? With left-leg only data, PRECISION is an accurate and dependable tool you can count on to gain new insights into your relative power. Even our own resident elite triathlete chooses to train and race with left only power. In her words “because it’s reliable”. 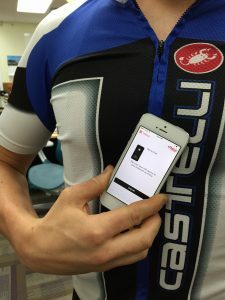 By adding this new dimension to your cycling, you can gain relevant information to guide your day to day training, as well as valuable information to compare your performance from event to event – all of this at the most competitive price in the market. And for those who want the highest level of data sophistication, rest assured! 4iiii engineers are already hard at work on implementing the same level of accuracy already offered as part of the left-side solution to a future dual leg system. And yes, we’ll remain committed to delivering future solutions at leading prices. That’s it for us this Friday. Remember to ride hard and smile often. If you are somewhere warm, take it in! 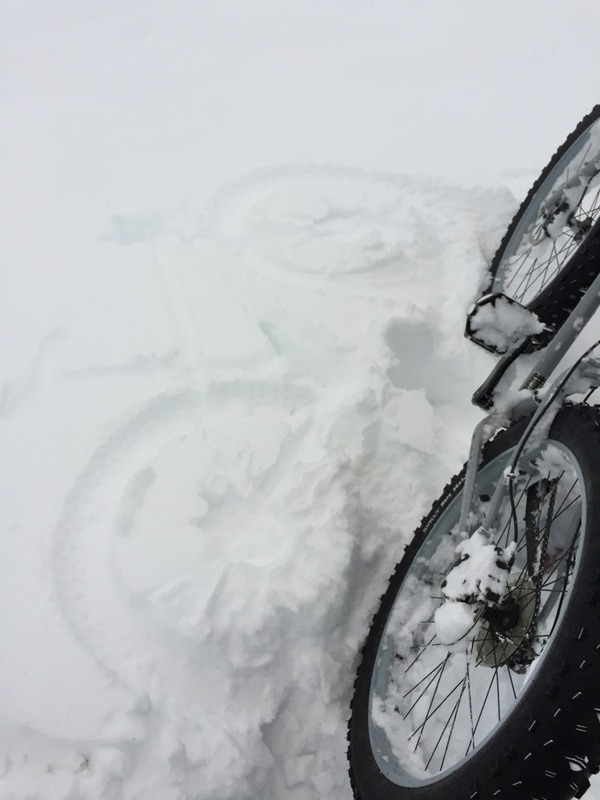 ‘Tis the season for Fat Bike Snow Angels! As you may have noticed, we included two, early-adopter Christmas presents in the recent PRECISION power meter firmware upgrade. These two cycling dynamic features – Left-side Pedal Smoothness and Left-side Torque Effectiveness – are exclusively available if you have already purchased PRECISION or if you purchase a PRECISION by January 15th, 2016. Pedal Smoothness measures how uniformly force is applied to the crank during a pedal revolution. For example, an output of 100 percent would indicate that you’re able to deliver the same amount of force all the way around the pedal stroke. This is nearly impossible since the human leg delivers far more force on the down stroke than on the upstroke. Knowing your pedal smoothness can be an effective way to improve your pedal stroke throughout the entire pedal rotation – not just on the down stroke. The second, time-limited PRECISION feature we are sharing with you is Torque Effectiveness. This feature measures how much of the torque you deliver per pedal stroke actually helps to move your bike forwards. For example, a Torque Effectiveness of 80 percent would indicate that 80 percent of the torque you are applying is moving your bike forward, while 20 percent of the torque you exert on the pedal is actually working against you or wasted as heat or noise. Similarly to Pedal Smoothness, this is a great metric for helping you grow more mindful of your stroke and its impact on your energy output and efficacy. Both of these features are single, left-side only implementations. While not the full dual-sided picture, this is a unique opportunity for you to test drive developments percolating at 4iiii. 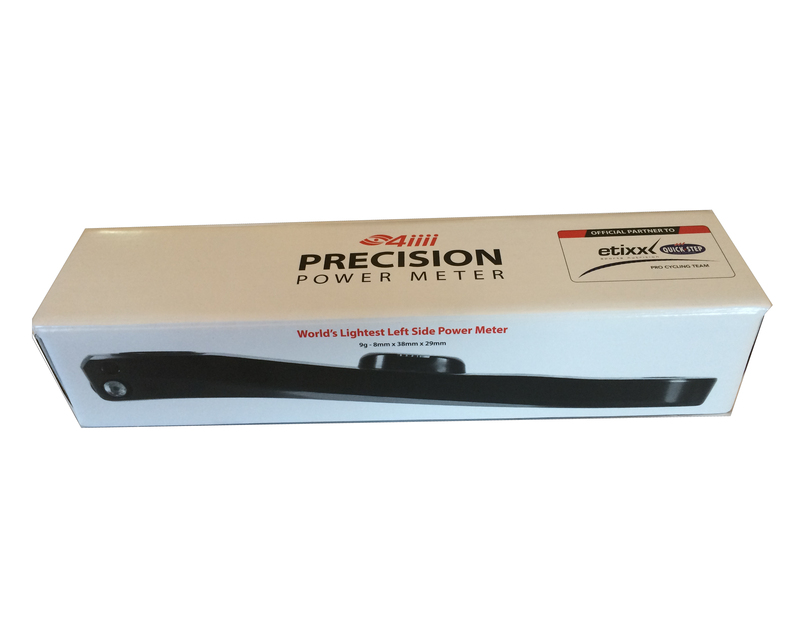 To take advantage of this offer and incorporate both Pedal Smoothness and Torque Effectiveness into your cycling regime, order your PRECISION power meter before January 15th, 2016. Place an order now or for more product information, CLICK HERE. This Holiday, ride hard and ride smart with PRECISION. Your responses to the upgrades have been very positive and it appears that many of you are well immersed in the new features. We live to hear your comments and suggestions as they really do inspire us to innovate. For anyone not seeing your device information as you upgrade, do not fret. It may only be a case of having to clear your Bluetooth cache. If you want help, just send us an email to support@4iiii.com and we’ll walk you through it. Now, onto something that is a true fusion of our winter season and passion for biking (and maybe a little post Thanksgiving relief for some? ): Fat biking! 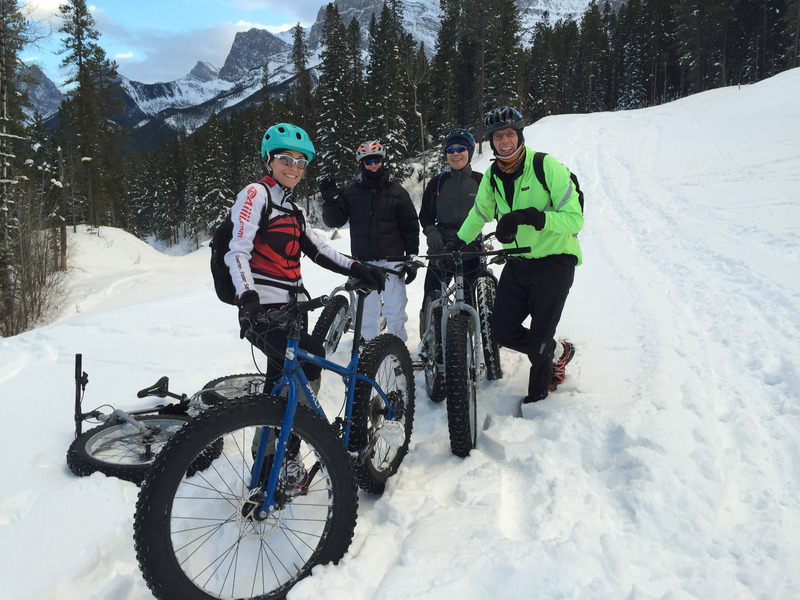 Our own crew has had some ‘fantastic fun’ riding fatties under the blue Alberta skies. 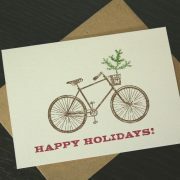 Here’s to the start of a healthy and happy holiday season! • This app is your gateway to emailing stored Activity Logs to your preferred training app or site and the 4iiii web store. • You can now Customize the Names of both your Viiiiva and PRECISION, which makes it easier to recognize your devices. • Tap to Pair is just that – tap your smartphone to your Viiiiva for instant, super simple pairing in any crowded ANT+ or Bluetooth Smart environment. • Activity Logging (also known as file save, memory and store and forward) lets you save data directly on your Viiiiva HRM even when you aren’t carrying your phone. It holds up to 65 hours of ANT+ sensor data. Activity Logs can be emailed via the 4iiii app to your chosen training software. Of course, you can also see your data in real-time if you have your Sportiiii, smartphone or other compatible displays like smart watch, or bike head unit with you. • The upgrade’s improved heart rate algorithm gives you superior R-R (beat-to-beat) measurement for determining Heart Rate Variability (HRV) and your level of activity readiness. Highly responsive heart rate sensing allows you to see quick changes in your performance (eg. Intervals). • 10x increase in sensitivity to pick up even the lightest of heart rates. • Indoor gym Fitness Equipment compatibility connects you to ANT+ enabled cardio equipment. • Viiiiva is the bridge that connects the 4iiii iOS Cliiiimb app (version 2.2.0) to 4iiii heads up audio visual coach, Sportiiii. With audio and visual cues, Sportiiii is a great tool to keep you in your zone training, and king of your mountain on Strava segments. • Two battery improvements: You’ll go further with PRECISION’s 25% improved Battery Life and the Battery Status Indicator will alert you when it’s time to change your battery. Pay attention when your battery status shows as ‘low’ because that means you’ll have about 20 more hours before it’s time to change out the 2032 coin cell. • Improvements to Zero Offset allow for robust and reliable handling of calibration values, thus maintaining accuracy. • The Adjustment Scale Factor was introduced to address the fact that PRECISION is (currently) a left-only power meter, and not everybody has a 50/50 left-right balance. Perhaps from training on some different equipment, you know that your left leg is actually weaker and you have a 45/55 left-right balance. Doubling the power from your left leg (as per PRECISION and all single sided power meters), gives you a total power of only 90% of what you’re actually putting out. In order to adjust for this, you can simply set the scale factor to 50/45=1.11111. 50 because 50% is your desired reading for PRECISION (half of your total power output), and 45 because your left leg is actually only putting out 45% of your actual total power. This scale factor can also be used to match PRECISION’s output to other training equipment you use. And now, as we share this much-anticipated release, we wish a Happy Thanksgiving to our US neighbours who will celebrate next week. 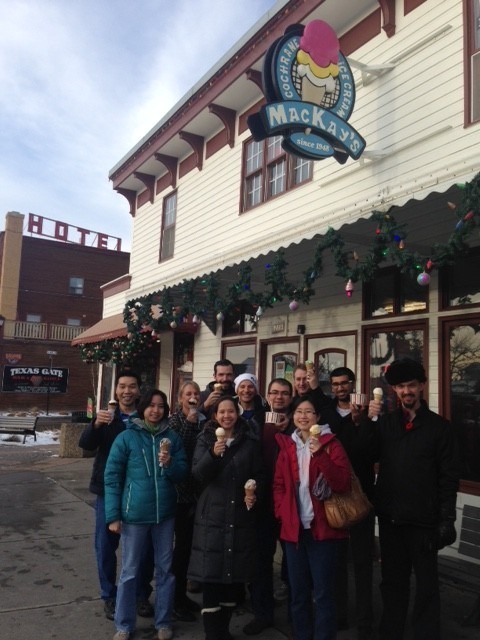 While you’re all prepping for turkey and the trimmings, we offer you a wintery toast with our hometown’s world famous McKay’s Ice Cream. 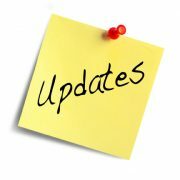 – Upgrades for 4iiii app (iOS and Android) are still under review at the app store and we anticipate approval any day now. We will release FW upgrades for both Viiiiva and PRECISION as soon as we receive this. – Right side PRECISION continues to test well. As you’ve seen in (DC’s blog), this product is a different configuration to our left side PRECISION and is now solidly progressing through all of our quality assurance and development gates. Timelines will be announced as soon as we have them and, as per usual, you’ll receive information via this Friday File and direct-to-consumer emails. 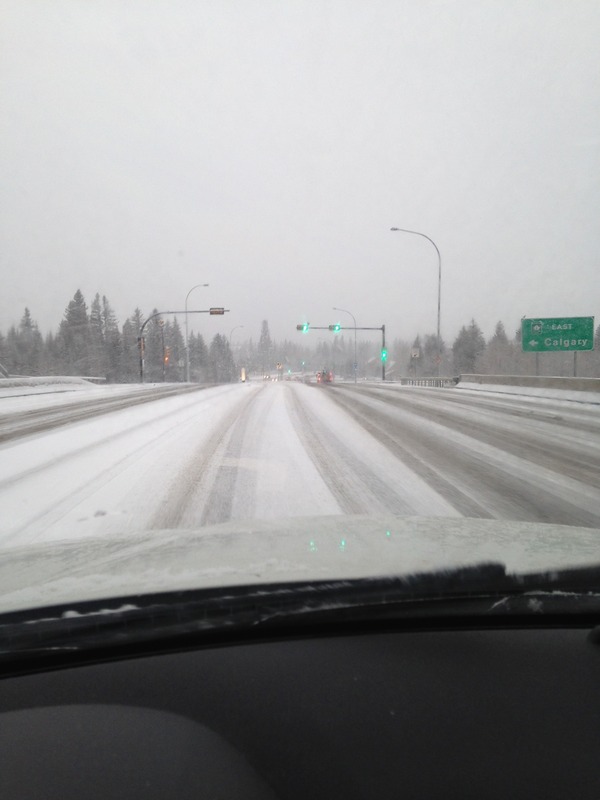 Got our first taste of winter coming in from Canmore this morning. Late Fall in the Rockies! 4iiii’s Viiiiva and PRECISION app upgrades have now been submitted to the app stores. Notifications on your smartphone will confirm when downloads are available. This week, we reached out to power guru Hunter Allen for his off-season riding wisdom in the hope of helping your transition to the great indoors training and build on the momentum from your steady summer riding. 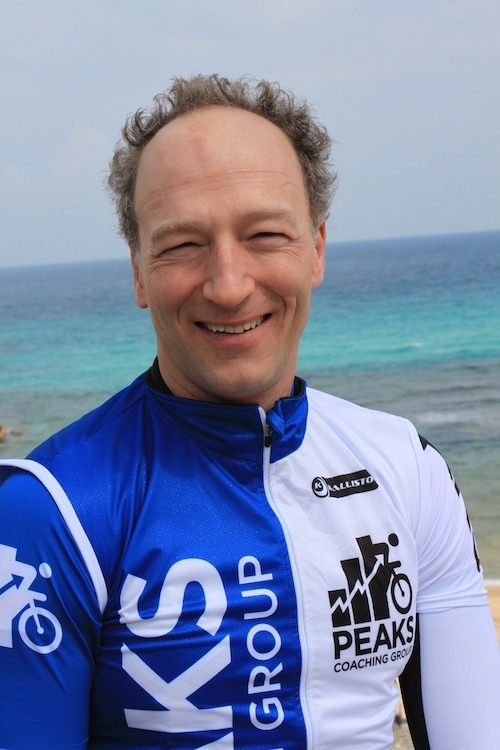 Hunter is a legendary cycling coach, co-author of Training and Racing with a Power Meter and Cutting-Edge Cycling, co-developer of TrainingPeaks’ WKO+ software and founder of Peaks Coaching Group. You can download his free How to Start Training with Power ebook. “I got into cycling because my parents didn’t want to get me a motorbike,” laughs Hunter who made his early beginnings in BMX at the age of 11 and later joined the professional Team Navigators where he raced for 17 years in Europe, South America, the USA, and Canada, and accumulating over forty career victories. 10 x Tractor Pulls! 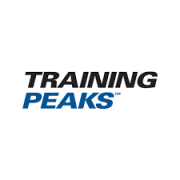 These are big gear intervals (53:13) – starting at 50 rpm at a slow speed of 8-10mph. Stay seated for each one, and keeping abs tight and hands on the drops. Try to rip the handlebars off the bike!!! STOP the effort when you reach 85-90 rpm. Recover at 80% of FTP between each for 3 minutes. 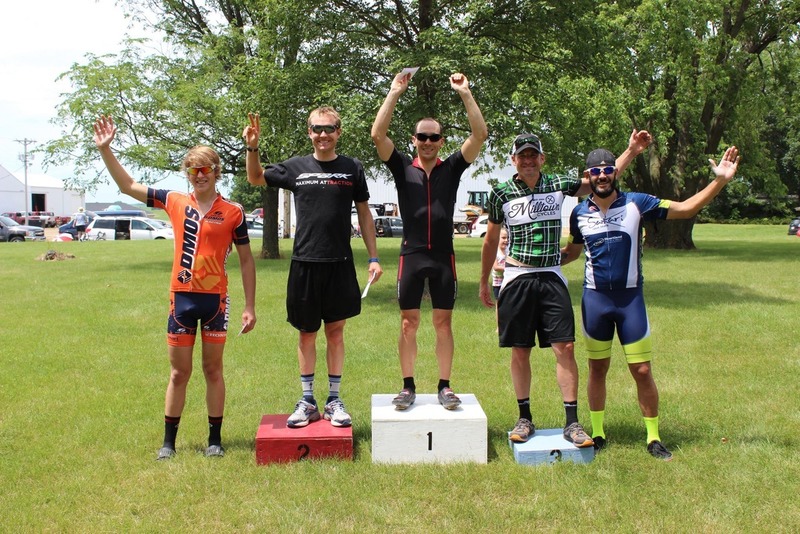 Since retiring from professional cycling, Hunter has become a USAC elite-level coach, a certified nutritional consultant, a certified yoga and tai chi instructor, personal trainer and a fitness and wellness entrepreneur. To date, this Bedford, Virginia resident has coached more than 400 athletes spanning Olympic, pro and weekend warrior levels, with a philosophy based on leveraging power output. 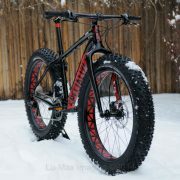 While Hunter sees tremendous performance benefits in using power meters, he also believes power makes riding more fun. When asked what one tip he’d like to share, Hunter is quick to say: “Invest in yourself. We can all spend money in a lot of different ways but to invest proactively in your fitness and seek good advice makes a lot of sense,” tells the coach who frequently leads winter cycling camps in California and Spain. “Many people think that having a coach is unattainable and limited to the elite but really, it’s probably the best investment you can make in yourself if you want to see meaningful results,” he concludes. Next week, the pending upgrades for Viiiiva and PRECISION will be submitted to the app stores. Right side development continues to go well. We extend great thanks to our beta testers who continually help us to keep things on track. Along with designing and developing apps and products, a new 4iiii kit design is also in the works. Most cyclists, by personal admission, are quite fashion centric and happily immersed in this sub culture. So, if you love anything about existing industry kits and want to share, send your comments our way to cranks@4iiii.com. 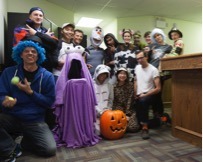 The 4iiii Technologies team took a short break to enjoy some Halloween fun! Given that the Halloween weekend is upon us, you may be replacing your kit for a themed costume. There are still a few final opportunities to be active on the bike and smell the fresh air before indoor training really settles in. In Mason, Ohio catch the After Dark Cincy 3 – Kings CX race and in New York, the Tour de Frights ranks as a fun Halloween themed cycling event. Whether you’re out there cycling for speed, fun or both, make sure to ride safely. 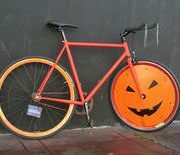 And, if you’ve already transitioned to indoor cycling and need tunes to help you get into the mood for spooky cycling, check out this Hallowe’en Cycling Mix (60 minutes). T’il the next Friday File, happy trick-or-treating! P.S. 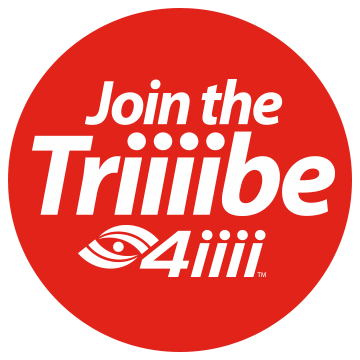 If you’re you an enthusiastic 4iiii product user with a great story to share, let us know at info@4iiii.com. 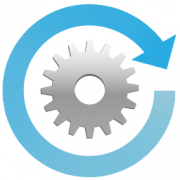 Firmware upgrades for Viiiiva and PRECISION are on track and testing is nearing completion. The updated apps will be submitted to the app stores shortly and, as always, active customers will receive direct email notifications regarding the release. We’ll also update you on the Friday File. As PRECISION customers move their performance to a whole new level with the addition of power data, here’s a view of a dedicated cyclist. Meet mathematician Paul Savala, a keen numbers guy who used his brain as much as his legs to win his first race. Race Bike: Lynskey Cooper, titanium road bike with PRECISION power meter on left crank and Garmin Edge 500 head unit. Why Cycling? In high school, I tried a bunch of sports like baseball and weightlifting. Because of my smaller physique, I was having a hard time thriving in those sports. One day, a friend invited me for a bike ride and it was an immediate fit for me. As an analytical person, I love the structure of competition and training. It’s an aspect of my life I can control and push myself in. Cycling also makes me a healthier human being. As you can read on my blog titled “How to Win Without Being Fast”, I’m extremely strategic in choosing which races I enter and make sure they complement my strengths. I carefully study each racecourse I compete on and try to plan my training to emphasize the key course features. Training with PRECISION has been essential to making sure I train exactly the way the course will challenge me. That means that if a course ends with a huge hill, then I’ll make sure all my training rides end with a heavy load. The combination of all these elements, from the races I chose to my training approach and tools made a huge different for me this summer. How has riding with a power meter changed how you train and race? Monitoring my power has been key to helping me get stronger, faster and smarter about my training and racing. Overall, having PRECISION has motivated me to be more strategic about my cycling and given me the data to quantify my efforts and improvement. How do you integrate all your training and racing data? I use Golden Cheetah. I’ve written a blog post on how I do this. It started as a tool for cataloguing my race experiences. It’s evolved into extensive discussions about how I make the most of my training and racing – especially using the power meter. I enjoy all the fall riding in the Midwest US. The colours are bright and the air is crisp. Everywhere! I’d really like to bike in Belgium and experience the deep cycling culture there. Like most North Americans, I’ll be hitting the trainer to get ready for next season. I’ll continue to use my PRECISION throughout the off season. 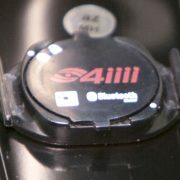 If you’re you an enthusiastic 4iiii product user with a great story to share, let us know at info@4iiii.com.